Experience the only 4-Diamond Lodging in Bucks County! 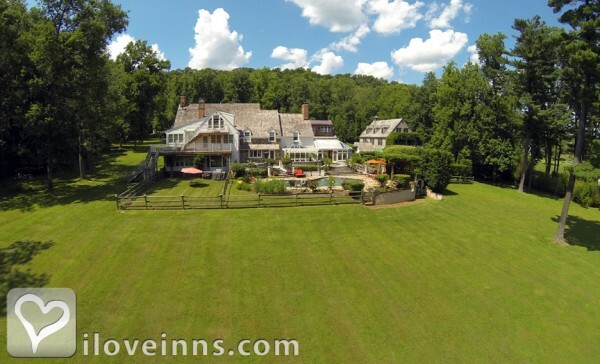 Escape to a beautiful romantic retreat on a 5-acre gated and manicured estate. Celebrate life's special moments and create new memories at this exceptional New Hope Bed and Breakfast Inn that features 6 rooms and suites with King-size featherbeds, 2-person heated whirlpool tubs, fireplaces, seasonal heated pool and hot tub. A multi-course gourmet breakfast with � La Carte choices can be served in the privacy of your suite or fireside in the rustic dining room. In-suite couples massage available on request. Relax, celebrate, connect and remember! Winner 2013 Top 10 Romantic Inn. Payment Types Accepted Include Visa, Discover, Travelers Checks, American Express, Personal Checks, Master Card and Cash. This property has 8 cottages with private bath, 8 with fireplaces, 8 with whirlpools, 4 total suites, including 1 two-bedroom suite and 1 conference room. The types of beds available include King. Guests report "Romance never felt so good!" Overall ambience, room decor, bathrooms, location, orchid conservatory, idyllic setting and grounds. named in the top 10 most romantic inns in the nation 6 times by multiple organizations. Tastebuds, Marsha Brown, Martines riverhouse Lounge. Exceptional Stay Inn at Bowman's Hill The wife and I have just enjoyed our FOURTH stay at Bowman's Hill B&B Inn. That pretty much says it all. From our first stay to our fourth we have relaxed in the wonderful tranquility of this secluded estate. The surroundings, the quiet, the attention to detail, were exceptional. The Innkeeper and owner could not have been more gracious. As in the past our time now is spent with the memories of a great getaway, as we look forward to our next romantic escape to The Inn at Bowman's Hill. I love this place! I keep coming back... Beautiful grounds, super comfy beds, delicious breakfast. Tim is so excellent and friendly, you have to meet him... The Inn at Bowman's Hill is my favorite local weekend getaway! Highly recommended! the best romantic inn ever!! Romantic & Beautiful every detail! This inn is exquisite! Every detail is amazing! The atmosphere is romantic, you never want to leave the room (even though New Hope has so much to offer) The food is terrific too! How life could slow down a minute! What a way to escape from the every day life and be with the one you love with out the distractions of every day life. This happening in the most beautiful setting a couple could possibly ask for! With the detail leading you to think you are the only couple this haven was created for. My wife and I stayed here for her birthday in the beautiful English Manor Suite. The staff was wonderful and the experience was outstanding, the breakfast alone was worth the stay! This charming inn exudes sophidticated romance. My wife and I celebrated an anniversary recently at the inn. Everything at the inn helped make our anniversary special. I highly recommend staying here. An awesome place! We've been there several times and got both engaged there and spent our wedding night there. Grounds are beautiful, rooms are very romantic, and the signature breakfast is fantastic. We enthusiastically endorse!! 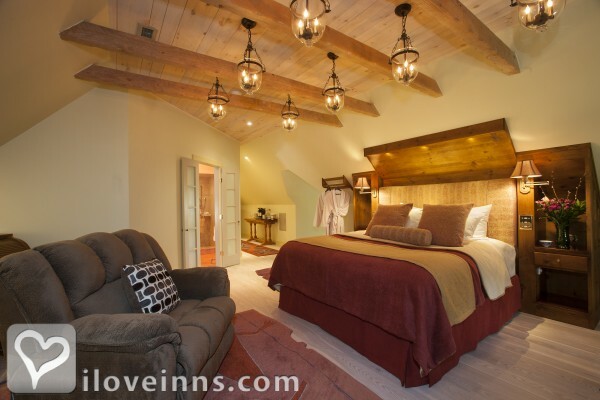 If you are looking for a purely seductive and romantic weekend with the man of your dreams then you must get away to The Inn at Bowman's Hill. As your car glides through the beautiful wrought iron gates in the evening, you are greeted by the twinkling lights surrounding the beautiful stone home, sparkling fountains and beautiful gardens. You can treat yourself to morning coffee or tea from your individualized china service just outside your bedroom door, wander down to an amazing gourmet breakfast in the warm dining room and explore the gorgeous property before your head out to the charms of the surrounding Lehigh Valley and the quaint shops of New Hope/Lambertville. It is the perfect escape with your wickedly wonderful lover! The Inn at Bowman's Hill was a romantic oasis for this long distance couple. Being away from each other is difficult so when my boyfriend and I got together for a romantic getaway, this was the perfect place. We were greeted by the gentleman at the front desk who remembered my booking which made the check in very personal, remembering details like the fact that we were there for my boyfriends birthday. The room was simple and elegant, letting us feel as if we were in a far away retreat rather than a few hours from home. The setting was quaint and quiet, with many places to eat and things to see that were walking distance. Though it was cold, we loves strolling the nearby town. When we arrived back we were greeted by the same gentleman that checked us in, wishing my boyfriend a happy birthday. The next day we went out and the room was cleaned immaculately. We never had such a beautiful weekend together as we did there. From the service to the furnishings, to the amenities, it was fabulous and an experience we will remember for a long time. You can't get much more romantic than two wing chairs by the fireside, a view of falling snow, complimentary champagne and music wafting out of the Bose radio. A very comfortable bed and huge jacuzzi bathroom coupled with a congenial host and wonderful breakfast the next morning are all ingredients of a memorable stay. The inn is a delight and conventiently close to New Hope, Bowman's Hill Wildlife Preserve and great dining experiences. This may turn into an annual event....next time in the warmer months to take advantage of the lovely grounds and pool. This has always been my favorite stay with my girlfriend, now fianc�. The grounds are intimate and romantic. I would suggest Bowman's to anyone!!! You can not get a more comfortable and welcoming stay anywhere in the world! We thought that the TV commercial was cute...then we came for a visit and realized that this place is so much better - it is simply amazing. We enjoyed every moment and cannot wait to come back. The Inn at Bowman's Hill filled our romantic getaway exactly as we needed. We have been married for 10 years this Valentines Day. We work together and play together. We needed something to bring our romance back, and WOW. We are happy to say, STAY..
As you pull up to the Inn your heart skips a beat as you know romance is in the air. The rooms are gorgeous and comfortable and feel like a home away from home... but better. The ambience is relaxing, beautiful and romantic and it was a true pleasure to stay. I was looking for a place to take my wife for her 40th Birthday. Having been to Bowman's Hill (the tower, not the Inn) many times in my youth, I thought it might be cool to bring her there. The Inn was absolutely Beautiful and the staff was beyond compare in ensuring the visit was perfect. From the cozy breakfasts, snacks and local Restraunts for meals to the quiet, romantic walks around the property, this was everything we could have asked for and more. Well worth the price of admission. My husband and I got to spend a couple of wonderful days here. Peaceful, romantic and thoroughly enjoyable. Would definitley recommend it to anyone who wants a unique getaway experience! This inn by far is the most romantic place my husband and I have stayed at during our 10 year marriage,cant wait to plan our next getaway.the staff also couldnt be anymore wonderful. Without a doubt, the Inn at Bowman's Hill is a top desination for romance throughout the year. It simply doesn't get any better... treat yourself to an escape and thoroughly relax and enjoy the wonderful amenities and services, well-appointed accommodations and hospitality of the inn. Stayed at the tower suite with my bf at the time and absolutely loved it! It was comfy and the hosts were great. The showers were amazing felt like being in a spa. Double jacuzzi with tv was amazing! I loved the property, I wish for the amount of money, they have you a bottle of wine or champagne. Other than that. Amazing! I was addicted to their breakfast. The Inn at Bowman's Hill is a hidden gem! Staying at your Inn is like staying at a 4 star hotel only better. This is a romantic place and we were lucky enough to find it. It is an amazing destination. Thank you so much, we are looking forward to returning as soon as we can. Our stay was absolutely wonderful. The best B&B experience ever. We had an opportunity to stay at the suite at the Inn at Bowman's Hill for the weekend. It was luxurious and elegant. The tub is so huge we could both fit, and the water was hot enough to fill the whole thing! The heated floors when we got out were pure luxury as it was a chilly day out. After having a snack the sun came out and we took some nice pictures in a sunny nook on the back deck and bundled up to read our books. What a peaceful escape from our world. We were recommended a restaurant in town which is still one of our favorites, and returned to the Inn's elegance to climb into the GIANT comfy bed. It was so comfortable we got ourselves a feather bed at home so we could have the same comfort as this top notch Inn! While the surroundings were luxurious, elegant, peaceful- the difference was made by the owners and staff of this Inn. There when you want them, gone when you don't, friendly, helpful and genuinely nice people. If only we'd had more time there! Can't wait to go back. Wait- I didn't mention how clean everything was, because you just didn't notice it- there was no time that I thought 'Their maid missed that' -no jarring 'ew' note, it was just clean, comfortable and yes, I'm going to say it again, luxurious. Thank you so much for a wonderful stay. The inn at Bowman's Hill is the perfect spot to get a way for the three Rs (rest, relaxation and Romance). If you are looking for a getaway this is the place! Not only are you close to New Hope for shopping, food and entertainmetn, but also the Inn is extremely romantic and the perfect getwaway. My wife and I had a VERY relaxing, sans kids, weekend at the Inn. It was late January and the snow was beautiful on the grounds, while tr inside was warm and cozy. The main dining hall was perfect for the ambiance we wanted - warm, large fireplace, and full of light from the large south facing windows! Thank you, Tim, for a great welcome and continued great seTrvice throughout our stay. Our tower suite was beautiful and gave us plenty of room to relax in the living room or the steam shower(!). All in all, a very impressive experience and one that we needed. Our stay was wonderful. We even got breakfast served to us in bed for my birthday. You cannot get much more romantic than that. The staff was amazing. Our stay was in late October and the staff offered to clean out the pool just for us. We declined,but the offer still sticks with us. It was way above and beyond. We have and will continue to recommend the inn as a romantic get away spot. This was among the top 5 romantic getaways ever - a gift for my husband's birthday. The accommodations were so plush, the steam shower amazing and the jacuzzi big enough for a 6'3" guy and his wife. Nice restaurants and shops around the corner but we hardly left this cozy, quiet, most romantic suite of rooms. We very much enjoyed our stay at the Inn at Bowman's Hill. Not only was the service top-notch, but it felt like we were in another world, away from it all. 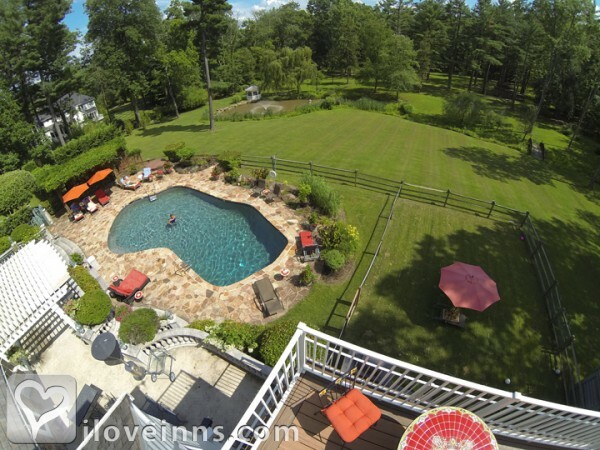 It is a great place for a romantic getaway in Bucks County. My boyfriend and I wanted to get away for the holidays and didn't know where to go. We searched the internet for places near New Hope, PA as we had heard it was a quaint little town. We found information on The Inn at Bowman's Hill and were NOT disappointed. Everything about the place was picture perfect - staying in the private carriage house, the holiday decorations at the Inn, the wine and snacks waiting for us in the room, the bathroom was a room unto itself, the amazing English breakfast, and last but not least, the amazing feather bed! It was the most comfortable bed we ever slept in! The proprietors were friendly and welcoming and we would definitely go back again for another romantic weekend getaway! ......simply put, this place is "one of the great wonders of the world"!! Outstanding from top to bottom, no reason to go anywhere else, your King & Queen for your entire stay! One of the best Romantic weekends ever! Great service, breakfast in bed, Tim even organized a couples massage in our room for us. Afterwards we enjoyed the steam bath. Sheer joy. Definitely top of my list for Romantic getaways! A most wonderful 2 day getaway to the beautiful Delaware River area with lovely small artsy towns and hikes nearby!! The owner and manager, Tim and Mike, were wonderful hosts from our arrival to departure ---they were able to succeed in that delicate balance of being there for information about great restaurants, biking on the Canal Tow Path, hiking in the nearby wildflower preserve and the history of the inn, while allowing your privacy and quiet time to be maintained. They arranged for in room couples massage which were some of the best massages we've experienced in very luxurious but comfy rooms. Lastly, the breakfast would have been delicious enough but somehow the eggs that you gather yourselves from the onsite henhouse taste even more scrumptious! We stayed here the night of our wedding. It was the perfect way to end a perfect day! My partner and I simply love the Inn at Bowman's Hill. From the moment you pull up to the inn's most impressive gates, you are just blown away. Tim, the innkeeper, is a GEM -- comes right out to greet you and help you in with your bags. The accomodations (LOVE the English Manor Suite) are luxurious and so comfortable. Food is always amazing. Just such a warm, welcoming feel. Very LGBT-friendly. Have been a repeat customer now for three years and will continue to stay there on every trip to New Hope!!! I have not had the pleasure, yet, of staying at this enchanting inn, but I am intrigued every time I receive an email or pass by after a drive to New Hope and Lambertville. My husband and I love beautiful places to stay, and somehow keep missing this divine inn. We will make our way there, but without even having stayed, we are 100% sure it is a TOP romantic inn. My husband and I stayed here for my birthday. The property and rooms are beautiful, quiet, and so romantic. We live locally and have children at home so only stayed for one night, but the location is surrounded by cool little tourist towns brimming with personality and all types of great restaurants. Whether you like adventure sports or your favorite past time is people watching... you will have the best of both worlds. Enjoy! I wanted to surprise my partner for his birthday and we were both impressed! We stayed at the orchid retreat room and everything, from the decoration of the room to the suroundings, was so gorgeous! The hot tub in the room was very spacious, and the feather bed was amazingly comfortable. In the morning they brought us breakfast to the room, everything was fresh and so delicious! You can only have great memories from this beautiful place. I would definitely go back. Until 2000, I had never been a B&B person until my wife took (dragged?) me to one on the Jersey Shore. I was hooked. Now 12 years later and probably 50 different B&B's stays in the NY/NJ/CT/PA area we've seen a lot and we loved Bowan's Hill. With two young kids, romance in our house is at constant war with soccer practice and convincing our 6 yr old son that the world is not his urinal. So when we can covince our parents to watch the kids for a night or two, we love to get away to an area B&B (we live in North Jersey) We spent our 10th wedding anniversary here and it was outstanding. We stayed in the Pond Vista room (it was October) We've been in enough places that typically even nice B&B's have some tradeoffs- beautiful room but no view, etc. You are hard pressed to find a tradeoff here. Our room was great the jacuzzi, the view, all of it- I literally can still remember the color of the yolk from their fresh eggs- it was this dark yellow color that just doesn't look like store bought eggs. There's an instant immersion once you are there where you just feel stress melting away and that's not as an easy thing to do but when you can only get away for a night or two, it's a huge deal to us. It's not cheap and we don't throw money away but we also don't mind spending it when it's earned and Bowan's Hill earns every penny. If we have one complaint it's that our reality means we have to often book last minute Saturday night trips and there often aren't rooms available. I had been looking for a special surprise for my wife, but so many of the 4 star hotels and B&B�s seemed to offer the same ordinary space as their standard rooms, but accessorized with higher end items. While searching the web, I came across the Inn at Bowman�s Hill. The pictures, amenities, location, and overall appeal seemed to hit all of the right notes. Shortly thereafter, we were treated to an evening of luxurious living, topped off by an amazing English breakfast (a spectacular treat for the girl from London). When the next important special occasion arises, I know that a night at the Inn is sure to keep us happy. The Inn at Bowman's Hill is perfect for a romantic weekend. We have celebrated an anniversary at the Inn and also gone for an impromptu weekend away. The rooms are beautiful, cozy and private. The soaking tubs are a wonderful treat, and the breakfast is incredible (best golden plum jam ever!) I know that we will return in the future and recommend them highly. Excellent room quality & amenities, great staff, close to town. Highly recommended. I loved my visit at the Inn at Bowman's Hill. We got married at the Inn on Valentines day 2011. It was a very private ceremony. The staff was so nice and helpful with everything, i honestly couldn't have picked a better place to have our wedding. They made sure everything was perfect even though i technically did not book a wedding pkg with them. I just wanted something simple. We had a few guests come (they wouldn't take no for an answer) and the staff even made sure even our guests were comfortable. I always tell everyone what a beautiful place this Inn is. From the moment you pull through the iron gates you feel like you are in heaven with all of your troubles behind you. Gracious is a word that goes only part way to describe our stay at this most romantic retreat from the moment of our arrival to our refreshed departure. We loved the quiet non-intrusive warm service, there if you wanted it - not there if you didn't, that always had time to advise on the highlights of the area or explain and provide a recipe of its cuisine. It was a beautiful away. Hopefully romantic may be your thoughts when you book your reservation, instead, it is the most romantic and beautiful property in the area. Not only do they have an exquisitely appointed home, a cozy breakfast room with original fireplace, but a garden room and views of the classic swimming pool and beyond; The interiors of the adjacent tower suites and rooms are all you could ask for, for a romantic getaway. Very Romantic, hoping to return in March to celebrate my birthday. My wife and I had a most wonderful stay. The rooms are as romantic and charming as the photos on the website. It was better than expected. Service is exceptional and friendly. The food was incredible. Only a couple minutes from downtown New Hope. We couldn't have asked for a better weekend.We will definitely be returning. This Inn is absolutely breath taking. My husband and I never had a honeymoon after we were married in October 2010. The Inn would be the perfect place to do such thing! Staying for the weekend would be like living in a fantasy with my wonderful husband! It's not often we find a destination that can take your breath away. The Inn at Bowman Hill exceeds any raves and reviews one can write. From the elegant service to the captivating surroundings, this Inn is a four season retreat for today's overly engaged travelers. Begin with a savory breakfast, then a massage..this is a place where guests are actually treated like guests. Once you have stayed here, you will know that for your next visit, book ahead. The Fall Foliage, summers by the pool, walks in the winter snow falls...you will come back! Plus, keep an eye out for specials...if you are lucky! As one of my husband and my "getaways" we traveled to New Hope, Pennsylvania to the Inn at Bowman's Hill. What can I say about this beautiful B&B? Tim, the innkeeper, welcomed us with open arms on our rainy and chilly arrival on Leap Day and even though it is winter and the grounds reflex the winter's chill, the Inn was spectacular as we drove through the front gate. Our room was the English Manor Suite - with a bathroom to die for. A hugh spa tub and a hugh marble shower with so many shower heads that we spent quite some time playing with them to get just the right coverage. The bed was massive and very comfortable. Tim made sure our breakfast up to the standards of this wonderful place. I had the English breakfast (which includes baked beans - a new breakfast treat for me). Some places we had visited, are great - but the Inn is in New Hope, which is such a eclectic little town with fun things to see and great places to dine. Could not have been any better....we will be back and stay longer this time! My husband and I stayed at the Inn at Bowman's Hill for our first anniversary. Your custmomer service is outstanding. Our room was exquisite! From the decor to the beuatiful view, it was absolutely a dream. We loved how you provided a little snow, just to set the scene! This year we celebrated our fifth anniversary. Every year, we say, we are going back to our secret little hideaway at The Inn at Bowman's Hill....now, we just have to book!! Romantic Rekindling if our Love. My wife and I had been having critical issues in our marriage. I scheduled a weekend get away here in hopes of getting our spark back. And sure enough, We're back happier than ever. From check in to check out, the best experience we've had since our Honeymoon. Thank you to the entire staff if The Inn at Bowman's Hill. Heat up the romance or come for some r& r . The Bowman's Inn is the most beauitful ,romantic B&B ever !! The welcoming staff and warm surroundings will soothe all your senses in every way . Guaranteed to leave u wanting more.. The Inn At Bowman's Hill is a truly lovely estate in the country. The friendliness of the staff is unparelleled and the rooms are absolutely gorgeous. Big bathrooms add to the pampered feeling. The setting is very tranquil, but close enough to New Hope to enjoy shopping and eating. A perfect place to spend a few days with a loved one! The Inn at Bowman's Hill has to be THE most superperbly romantic inn in the country! Mike and Tim treat their guests like royalty. Romantic does not begin to describe the rooms. TOTALLY AWESOME is the best way to describe The Inn at Bowman's Hill. I had never stayed at an Inn before, but we always talk about trying a B&B, so I was super excited when I won a 1 night stay to the Inn at Bowman's Hill in a raffle. I booked over the phone (due to the gift certificate) and the gentleman I spoke with was very nice and the booking process was very easy. He asked if we were celebrating anything special and we said we were, our recent engagement. I had read online from many others that the hotel often placed something special, like champagne, in the rooms for celebrations. I was looking forward to that. I received the email confirmation as expected and looked forward to our stay. I noticed online that the hotel has feather beds (to which I am allergic). I emailed to ask if there was an option of hypoallergenic bedding and never received a reply. I called to confirm and was told to email my request. I mentioned that I did already but had not heard back. I was told that "we wouldn't have emailed back." That seemed a little odd, but I was happy to hear that the bedding was available. The location and building exterior is lovely. When we pulled through the gates, the approach was very regal and impressive and we were excited for our evening. We were met at the car by the innkeeper who led us inside and explained about the inn and showed us to our room. We were booked in the Regal Tower Suite which is part of the main building. The innkeeper showed us the bathroom which had some very exciting features (and I LOVE a fancy bath). There is radiant heated flooring, shower with multiple shower heads and rain shower, and a whirlpool tub for 2. I was very looking forward to trying it all out. We took a walk of the grounds, sat for a while in the screened in gazebo and befriended the chickens. It was enchanting. We headed in for a cup of tea and some rest before dinner. I am a huge tea fan and was excited to see a tea set and electric kettle. I set about prepping our tea when I noticed something very unfortunate. The tea pot had the remains of someone else's tea in it! I was a bit disappointed, after all this room retails for $500 per night, but since we did not pay I did not alert the staff the the issue and cleaned the pot myself in the bathroom. Tea made we enjoyed some of the snacks left for us in the room (cheese and crackers). There did not seem to be anything special to celebrate our engagement, but again we did not pay for the room so maybe they did not feel like "pulling all the stops" to impress us. After dinner we planned to take a dip in the pool (that, while mildly heated, was a bit too cold, but it was September so I was not surprised or disappointed). We were able to enjoy the hot tub, which we did for quite a while. You can see a million stars from the hot tub. It was very romantic. We went back inside to enjoy the wonderfully equipped bathroom. One of the shower heads worked fine. The other we could not get the extra jets to work. We kept trying to fiddle with it, but the knob just seemed to be broken. Then we tried to use the rain shower. The cold knob worked, the hot was broken and would not turn. My fiance is quite handy and was able to get it working by using one of my barrettes to turn the screw inside the handle. We had quite a laugh over that. We tried out the tub next which seemed to work fine, it was just missing the decorative porcelain handle for the tap. On the way to bed I noticed something odd about the ceiling. There was a hole with wires coming out. It looked like they had replaced a built in smoke alarm, but never finished the job. There was another smoke alarm, so it was not a safety issue, mostly an aesthetic one. The bed was comfortable (and did have the hypoallergenic bedding) and we slept fairly well. We went down to have the included gourmet breakfast. My fiance had the eggs Benedict and I had the Signature Fry up. The eggs were fantastic and I would highly recommend the fry up (even if it is missing the traditional black pudding). The only down side was that the innkeeper forgot to bring me the tea I requested and by the time it came I was almost finished with my food. We went back to the room to pack up. I am always concerned we will forget something so I check the closets, drawers and under the bed. It was under the bed that I discovered a dusty purple sock that WAS NOT MINE. We checked out and I did let the innkeeper know about the issues in the bathroom (hopefully it would be fixed before the next paying guest). I did not really bring up the other issues since our stay was over and I didn't feel there was much that could be done to fix things at that point. I will say that we did enjoy our stay since given the price we paid ($0) it was a great value, but if I had paid over $500 for one night I would have been extremely disappointed with the less than clean room and broken bathroom. The room seemed a little dated and it is probably a bit overpriced. I left feeling a little less than taken care of and thought perhaps it was because we were not paying customers, though that should not be an excuse for a not fully cleaned room. I would consider staying here again but not for the full price. Ending on the positive though, the innkeeper was very nice, the grounds were charming, having the outdoor hot tub to ourselves was divine, and you can't beat fresh laid eggs for breakfast. It's close enough to NY for an easy trip, but the atmosphere is hundreds of miles away. The Inn at Bowman's Hill is in a wonderful estate setting that is perfect for a romantic getaway. The rooms are luxurious and the bathrooms spacious. Everyone is friendly, but very conscious of your privacy. The lights will add sparkle to the nights. Best bed and breakfast I've ever stayed in. Everything is perfect from the time you enter the grounds to the time you leave. We have 2 children and a very busy schedule with both of us working and our children. So we don't get the opportunity to get away often. We spent an evening here at Bowman's Hill. It was so relaxing and quaint. Such a beautiful place with a great view and outstanding service all around. Thank you so much for your wonderful hospitality we had a Great experience and would recommend this place to anyone who wants to be pampered and enjoy a relaxing stay. Thank you!!! From the time we set foot on the property, everything was perfect. The innkeeper's helper showed us around the property, the kitchen, offered us snacks/beverages and finally led us to our room. The room was our private oasis for the weekend with a beautiful view of the backyard gazebo and stream. We had everything we needed: a comfortable bed, a full size shower, a jacuzzi, and a TV. Our last morning there we had breakfast in our room, which was a delight. The most amazing french toast I have eaten has been at Bowman's Inn. I'm looking forward to going back to this little heaven on earth! Thanks to our nephew Jason & niece Jenn, we were introduced to this romantic and lovely inn several years ago. The accommodations are wonderful, the setting is great and the amenities and services are terrific. We stayed at the Inn at Bowman's Hill this past July, my husband and I, and fell in love with this place upon entering the gates. Magical, Romantic, Beautiful, etc. The staff are so wonderful, catering to your needs and just nice people. We loved our stay and have recommended this place to all of our friends and family. Will definitely go back again and again. 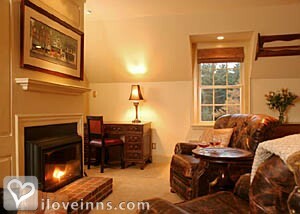 Please go to The Inn at Bowman's Hill for your romantic getaway. We stayed in a beautiful room in detached building that included a jacuzzi, beautiful glass shower, a thermostat regulated gas fire place, view of the grounds, and even a sound system. We have never stayed in a better Inn! Breakfast each was unique and delicious. Also received good recommendations for dinner in New Hope. We took advantage of the couple�s message in our room one day. Everything was perfect. Every year for our anniversary my wife and I stay at a different bed and breakfast. I have to say this... The Inn at Bowmans Hill is THE MOST ROMANTIC place to stay. The food is amazing, the rooms are clean and comfortable. ( the mattress is so comfortable we want to buy one ) the grounds are beautiful. My wife and I were supposed to go to New Hope village to shop and we ended up never leaving the grounds of the inn. If we could, we would visit once a month. I love this place and everything about it. I have stayed at the inn on two occassions and both times the service and rooms were excellent. The location is breathtaking. My wife and I were looking for that special getaway to escape the rigors of everyday life and the Inn at Bowman's Hill was certainly the right place for that. A great place to rekindle romance and indulge in luxury surroundings. A must for any couple. My wife and I made the very good decision to spend our 30th Anniversary at the Inn at Bowman's Hill. Mid-December found us at this cozy, warm, romantic Inn... the accommodations, fine breakfast, and gracious host made for a perfect getaway. I would recommend to anyone for a great way to relax and renew! Last year I stayed at The Inn at Bowman's Hill. It was for my boyfriend�s 50th birthday. I had known my boyfriend since we were kids, and we had met again many years later after our divorces. We fell head over heels in love and I wanted his birthday to be extra special. I had explained to Tim, the innkeeper, that I wanted a romantic room, champagne, and massages for two, as well as restaurant choices. He came through in spades. He chose a beautiful room for us with a balcony overlooking the spacious grounds, chilled champagne waiting for us upon arrival and other goodies. He had arranged massages for us, made dinner reservations and made us feel welcome. The inn is beautiful and impeccable. The breakfast is delicious, and the ambiance is perfection. My boyfriend and I can�t wait to go back to the inn and relive that romantic idyllic state of mind. My husband planned a surprised weekend at the Bowman's Hill to propose to me. The inn was absolutely amazing in every way. The rooms were superb with over the top shower options. I loved the fireplace where I sat to read every morning. Breakfast was fresh and delicious. You also have the option to have breakfast delivered to your room. The proposal was setup with the help of the Inn keeper and it was unforgettable. Thank you for making this a romantic part of our lives to remember forever. Most romantic inn that affords guests wonderful accommodations along with fine amenities and services. Bravo! The Bowman's Hill could not improve on anything! Well worth the money for a night of rekindling! Michael catered to our needs very professionally, and Anastacio amazed us with his over-the-top gourmet breakfast! What a lovely place to stay. You won't be disappointed. The rooms were clean and comfortable. I planned my proposal to my wife at the Bowman's Hill after reading many reviews. It definitely lived up to the hype of being romantic. She was surprised and of course said yes! The accommodation was 5+ stars and we loved the breakfast. The serenity and seclusion in every area and aspect of The Inn at Bowmans Hill was more than we could ever have wished for on our honeymoon. The amenities are in impeccable fashion, the morning breakfasts are BEYOND 4 stars, and Tim, the Innkeeper - one of the most pleasant people we had the opportunity to meet! As far as we are concerned, there are NO other options in the area aside from The Inn at Bowmans Hill. There is no better place to spend the most romantic of celebrations at, and we look forward to returning as often as possible! Thank you so very much! Our stay at Bowman's Hill was the weekend that my fiancee and I got engaged. We were looking for a romantic spot, and we found the best one possible. Whether it was hand-in-hand walking by the fish pond, swimming at their gorgeous pool, enjoying excellent food, interacting with the friendliest staff we've ever encountered, or lounging in our warm, comfortable and romantic room, it was the perfect place for us to start our life together. Thank you, Inn at Bowman's Hill. You simply cannot find a better place to spend a romantic weekend. My husband and I spent the weekend here after getting married in New Hope. It was an experience we will cherish and never forget. LOVE LOVE LOVE! Met The owner who was more than happy to go beyond the call of duty to make sure we were well taken care of. It was a beautiful compound to come to and just unwind. Will definitely be back. I spent my birthday there and it was the most memorable time I've ever had. I was treated like a queen! Our room was set up with champagne, roses and chocolate covered strawberries. We had a couples massage in our room and a wonderful evening in such a magical and wonderful place. Breakfast the following morning was the most delicious meal you could ever imagine. The staff are so friendly and work hard to give you an unforgettable experience. The Inn at Bowman's Hill is a wonderfully romantic getaway. We gave a weekend there to our kids for their anniversary and they had a wonderful time.....and we got the pleasure of taking care of our grandson. Definitely win-win. My husband and I have stayed at the Bowman's Inn a couple of times in different seasons and every time it was like a whole new place. We had an amazingly relaxing time. This place is surely the most romantic inn that I have been to!! One of the finest inns at which my wife and I have stayed - excellent accommodations accompany the highest level of service - our stay was a truly romantic experience! I've had the pleasure of staying at the Inn and continue to recommend it to everyone! Beyond romantic, the Inn is a very warm, cozy and lavish place to stay with the best food and most cordial hospitality. It's beautiful both inside and out and a MUST if you are in the area overnight! The most wonderful inn, the most wonderful staff! Amazing grounds, the rooms are beautiful. The English breakfast is so yummy, Tim is so accommodating , & sometimes we get to enjoy the company of Mike Amery, the inn keeper, a charming man. We have had the chance to stay at the inn several times, & the grounds are spectacular any time of the year. Happy new year to everyone there, we wish you much deserving success. Spent a long weekend in June and loved Every minute of the stay. Beautiful ! Romantic Inn with gorgeous grounds. Will be planning a trip soon as it is only 90 Minutes from NY. The Inn took us away from the everyday grind and transported us to a tranquil place. My husband Joe and I stayed at the Inn in March last year. We had just been married and were looking for a quiet retreat after all the excitement of our year of palnning and our wedding day. W both loved our stay and can't wait to come back. The hospitality offered was wonderful. The food amazing and the room and grounds were extra specail. Thanks so much for making that special time of our lives even more special. My husband surprised me with a trip to The Inn at Bowman's Hill, but we were both surprised by how amazing this bed and breakfast is. The rooms were spotless, and our own private fireplace and jacuzzi tub made it extra romantic. What really blew us away was that the owners, knowing I don't eat pork, went out of their way to get us turkey bacon for breakfast. It honestly meant a lot to me, and I cannot wait to go back. The Inn at Bowman's Hill oozes romance! A jacuzzi, in-room massages, elegant rooms and quiet grounds combined to make our stay a truly memorable one! The Inn at Bowman's Hill is not only beautifully appointed in every way, it provides cherished privacy whilst couched in a lovely location accessible to all things fun. From quiet but exceptional service, superior surroundings and delicious food to the finery of New Hope, one cannot leave without feeling pampered, rejuvenated and appreciated for having visited. Understated elegance, modern amenities, complete comfort - perfect backdrop to the most fondly remembered romantic weekend! My husband and I spent a long weekend at the Inn after we got engaged and we had a wonderful weekend. We were able to relax with in room massages. We felt well taken care of, and we can't wait to return. We referred friends and family who also thoroughly enjoyed their stays. After popping the question over a candlelit dinner in Lambertville, I surprised my fianc� with a night to ourselves at the Inn, before sharing the news the next morning. The service was impeccable and the setting serene. In the dead of winter, the warmth of the fire, complimentary chocolate-dipped strawberries and champagne, not to mention bubbling jacuzzi tub took our minds off everything else and let us enjoy our engagement. Now we're in the helter-skelter planning of the wedding, but we'll both always remember our stay at the Inn and come back in the future when we just need a momentary escape for two. Secluded, intimate and romantic! That's how to best describe The Inn at Bowman's Tower. Impeccably and maticulously maintained, the rooms at The Inn at Bowman's Tower are spacious, beautifully decorated with a romantic atmosphere that will guarantee you and your wife the well spent time together that you both deserve and were longing for. With spacious well appointed bathrooms and extra large tubs and a 5 star breakfast waiting for you each morning, you'll have the most memorable and wonderful time together you have ever shared. The service is first class and a variety of resturants and clubs are minuites away. One of the most romantic getaways we have had together. First class! My husband and I stayed at The Inn at Bowman's Hill to spend a weekend alone days before he was leaving for a year long deployment to Iraq. We knew we had picked the right place from the minute we entered the Inn's grounds and were surrounded by beauty and romance the entire weekend. Our room was incredible, the breakfast area was perfect, ( not to mention the breafast in bed we also took advantage of) the pool and pool area was great, ( which we used not only one of the days but also one night after returning from one of the amazing local restaurants! )and the service was incredible! They made my husband feel appreciated for his service and sacrifice for his country with a complimentary bottle of wine on arrival, and let us know they were there if we needed anything. 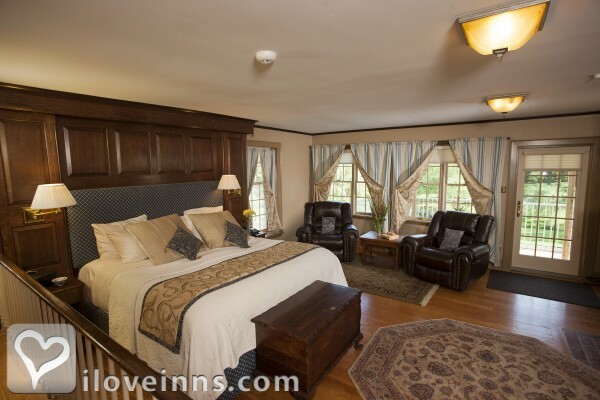 The atmosphere at The Inn at Bowman's Hill is pure romance, relaxation and fun and it is a great place to connect or reconnect with a loved one or to share a romantic getaway! If you want to go out to some of the very cool local bars or great restaurants but don't want to drive: Contact the cab company in advance ( they don't have much cab service in the area) and the driver will be there to pick you up, and drop you off wherever and whenever you want to go somewhere! This was a gorgeous inn. It was absolutely romantic and perfect. The breakfast was superb and the staff bent over backwards for their guests. I will definelty be coming again soon with my wife! We recently stayed here for a romantic getaway from the big city, NYC. We were impressed first by the friendliness of the staff. The grounds were amazing and our room was even better. The website photos are a very good representation of what it looks like but seeing it in person is totally on a different level. We would definitely stay there again. We stayed at the Inn at Bowman's Hill just before Christmas, and the champagne, candles, lovely room, and wonderful innkeepers all made our cozy, and lovely time together so very special...can't wait to go back in every season to such a romantic place! We had such a wonderful time at the Inn at Bowman's Hill for our 3 year anniversary in July! The grounds are absolutely beautiful, the staff friendly, and the rooms lovely. We wanted a relaxing, romantic night away and that is exactly what we got! We enjoyed lounging by the fabulous pool while classical music played and a fine mist kept us cool. Then it was off to our balcony to sip some champagne and relax. After we went into town for dinner, we were so happy to have a jet tub to come back to and a comfortable, cozy bed to sleep in. It finished the night off perfectly! Our wonderful homemade breakfast came right on time the next morning, which we enjoyed out on the balcony, completing our wonderful stay. We can't say enough good things about this inn...can't wait to return! Thank you for an amazing anniversary! We were entranced from the minute we went through the gates...everything was better than we hoped for. Every detail was special..fine sheets, soaps, etc. breakfast the next morning was really special and cozy. This is now our favorite place for a romantic get away! Even tho it's hard to pull yourself away from the Inn, the area of Bucks County is beautiful and scenic. And the Inn is just down the road from New Hope, a great quaint little town with amazing shops and restaurants. My husband and I love to escape to the Inn at Bowman's Hill. Tucked away in the woods, the setting is just breathtaking in any season. The last time we went it was in January. The quiet of winter, the wood burning stove, and the whirlpool bath(for 2) made for quite the romantic and relaxing getaway! The rooms are beautifully decorated; with the right balance of luxury and history mixed in. And the chef prepares a wonderful breakfast. There are also little touches that make our stay here special each and every time. It is also located very close to the historic and quaint town of New Hope, PA. Can't wait to go back! The Inn at Bowman's Hill is truly the best of all possible worlds (apologies to Candide): a wonderfully intimate lodging with the level of service one would expect at the highest corporate lodging standard of say, a Ritz-Carlton. The setting is wonderful: just outside of New Hope, which is a wonderful place to visit any time of year, but most especially during spring time. The room we stayed in (the Manor Suite) was an absolute delight. And the breakfast? Words will simply not do justice, but suffice it to say, you have not lived until you have had their eggs. Was it pricey? Yes. Was it worth every penny? Absolutely. Cannot wait to return. The Inn at Bowman's Hill creates an environment that relaxes and seduces a patron into a euphoric contentment. We enjoyed our stay immensely. The bucolic setting, welcoming decor, delicious epicuranean meals make one feel pampered and cared for. We'd reccommend this to anyone looking to rekindle their romance in their relationship. From the moment you enter the impressive wrought iron gates and go down the long, beautifully landscaped driveway, you know that your stay at The Inn at Bowman's Hill will be romantic and memorable. The caring Innkeeper, Michael Amery, has created by far the most elegant Inn for a country retreat in Bucks County. I've stayed at the Inn several times and each time was unique and very special. I love the personal attention that was given to me by the innkeeper Tim. He helped make my stays there amazing. Beautiful grounds, amazing rooms and service! Perfect and Romantic in every way! I absolutely love this inn. My boyfriend and I love visiting New Hope every year and this is our favorite place to say. It truly is the most romantic inn in New Hope. The rooms are luxurious and extremely comfortable. The location is so scenic and beautiful. It's very close to the center of town so the location is superb. Breakfast is so yummy and is served in the most charming rustic room. The staff is excellent and beyond helpful. If you are looking for romance in New Hope, this is definitely the place to stay! I highly recommend The Inn at Bowman's Hill. My wife and I stayed at the Inn for the first time this summer for our anniversary. We had such a wonderful time and the staff was really friendly. The breakfast was just amazing. One of the most romantic places we have ever stayed at. I would recommend the Inn at Bowman�s Hill to anyone. We stayed at thee INN and had the most wonderful experience ever. The staff was over the top and incredible. The room was perfect and the amenities are second to none. The Inn at Bowmans Hill in New Hope is a dream of a place. My husband and I were hooked from the first moment we saw the place. We hope to visit again soon. It is truly a romantic experience. The most Romantic wedding night! On a friend's recommendation, I decided to surprise my new wife and spend our wedding night at the Inn at Bowman's Hill. Neither of us was disappointed. Every little detail was just perfect - from the luxurious bed and fantastic en-suite bathroom (with jacuzzi!) to the wonderful, tranquil, park-like setting and the amazing full English breakfast in the morning. Neither of us wanted to leave - but we had a honeymoon to get to. Thanks to Mike and his amazing team for making it such a truly unforgettable experience that we will both treasure forever. We have considered staying at the Inn for sometime. 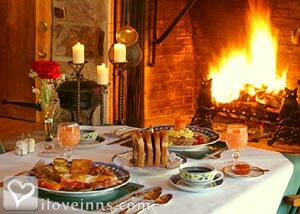 From the lovely website showing the ambiance, rooms with fireplace, breakfast offered would be an IDEAL getaway! A true credit to Mike Amery for his tireless efforts and eye toward perfection. Every detail of the Inn from the time the gates open is a credit to Mike and his teams pure attention to detail and making every experience a lasting one. We live only 15 minutes from The Inn at Bowman's Hill but when we stayed there for our 5th Wedding Anniversary it felt like we were in another world. A perfect romantic getaway for any occasion! My wife and I have stayed at the inn twice. While the inn is much more expensive than our usual accommodations, we do find it worth the splurge for special occasions. In 2006 we stayed in the Pond Vista room and in 2011 we stayed in the English Manor Suite; both were beautiful. The pictures on the website accurately depict how nice and comfortable the rooms are. 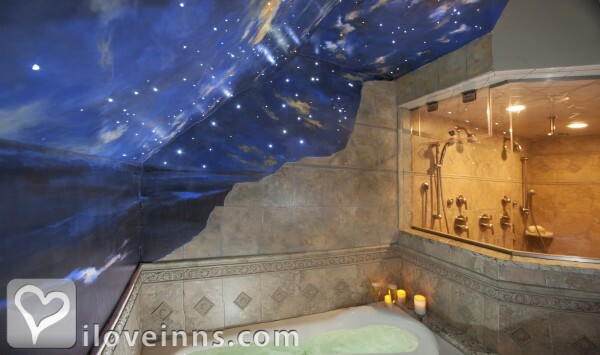 The English Manor Suite's shower is absolutely incredible. Breakfast is delicious. The service is wonderful and they find ways to make the stay even more enjoyable, for example by making freshly baked goods or soup for an afternoon snack. This Inn is a must for a couple looking for a romantic getaway and a sumptious coddling experience. Their is incredible attention to detail and the staff overachieves in all manners of innkeeping. Both Lambertville, New Jersey and New Hope , Pennsylvania are great towns to visit for shopping, dining, entertainment and antiquing. 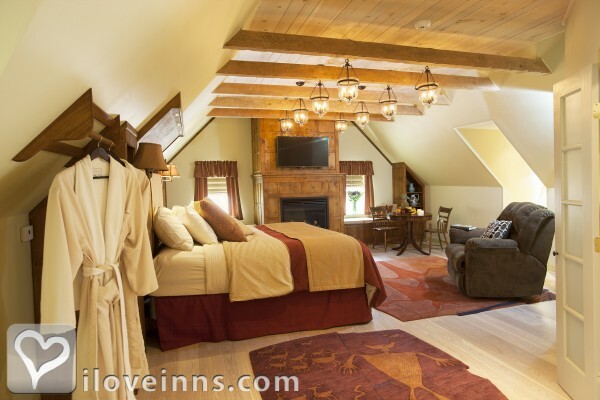 I have stayed at The Inn at Bowman's Hill on several occasions and it is second to none! From the attentive staff, to the beautiful sourroundings, to the luxurious linens, the Inn is top drawer. Add a night out in quaint New Hope and you have the perfect weekend! OMG. I don't think I have ever stayed at a better B&B. Just beautiful. Extremely romantic. The service is wonderful and the grounds so picturesque. Cannot wait to return in the summer when we can sit and relax by the pool. From the moment you walk in, to the time when you sadly bid adieu, The Inn at Bowman's Hill is the most romantic inn ever! Leave all your cares behind and relax in a haven of peace and serenity! My husband and I stayed here for our "baby"moon. It was a beautiful and romantic getaway for us at such a special time. The Innkeeper could not have been more accommodating and awesome - making the most incredible farm fresh breakfast for us! The property is so lovely- we felt like we were much further away than we actually were. What a romantic and beautiful setting! We loved it!!! Outstanding stay at �The Inn at Bowman�s Hill.� The service was exceptional; efficient, courteous and friendly. Loved the location, perfect for a romantic getaway. It�s surrounded by a horse farm and expansive fields. No other residences are within view from the inn. Each day horses were walked outside our window going from the barn to one of the paddocks. Great Staff! They go out of their way to make your stay very enjoyable and stress free! We love the place and the svc everyone should go and see it for themselves its a place that you do not went to leave. It a place you would love to good too every year. I will keep going because we love it. The tower is close by to see the shops are cute and have things that person make that live in New HOpe. Outstanding Bed and Breakfast! Courteous staff, always willing to please. Cooked to order breakfast are amazing! Never before have I been so enchanted with a Bed and Breakfast. From the moment my husband and I entered through the beautiful gate leading us to the Inn's breathtaking grounds, we were in awe! Our room was cozy and inviting due to its attention to detail. We strolled the spacious property, taking in all the beauty it had to offer, and then returned to our room for a romantic couple's massage. It was the perfect ending, to a perfect day. I would be remiss if I didn't mention the amazingly delicious breakfast that we enjoyed the following morning, made with eggs that we handpicked from the chickens that are raised right there on the grounds of the Inn. Now I know what a real country breakfast tastes like! I was sorry that our stay came and went as fast as it did, as I would have loved to stay longer. I haven't felt that relaxed and at one with nature in years. I have been to many Bed and Breakfasts and hotels over the years, but none have compared to the Inn at Bowman Hill. This is a visit to savor. We try to return once a year and every time is like the first time. The most romantic Inn around! There really is no other place like the Inn at Bowman's! Mike and his kind, courteous staff all personally go out of their way to ensure that above all, your stay is relaxing and romantic. From the beautifully appointed rooms to the bucolic grounds, it's like a little piece of paradise. My husband and I stayed here for a brief 2-day honeymoon. The staff was friendly but respectful of privacy. The location can't be beat with Bowman's tower and the Flower Preserve within walking distance. New Hope and Lambertville are just a hop in the car. I highly recommend! My husband & I had an amazing experience at "the inn". It was first class all the way. The inn grounds were charming & beautiful. The rooms were comfort and luxury combined. The breakfast was delicious and plentiful. The surrounding area is scenic any time of year. Wonderfully romantic & indulgent. Amidst the hills of Bucks County, PA, there is the most exquisite, picturesque, romantic inn we have ever had the pleasure of staying. Our room was decorated tastefully with just a hint of romance. The beautifully manicured grounds and the natural woodlands surrounding the property complimented the physical situation of the Inn. The staff was efficient, helpful and friendly. Highly recommend all couples to spend time there. My girlfriend and I were fortunate to spend a weekend at Bowman's Hill. I just happened to find out about it on -line and took a gamble. Everything from the greeting, accomadations, location, food, atmosphere and just the attention to detail were perfect. I would give the Inn my highest recommendation and I certainly plan to return. The spring foliage is awesome. Strolling through New Hope during the day and enjoying dinner in Lambertville is a perfect combination for an enjoyable getaway weekend. Our stay at the inn was perfect. My husband and I felt relaxed and taken care of from the moment we arrived. We had a couples massage arranged for us in our room on the first day. The staff was accommodating but never intrusive. My husband and I were able to spend carefree time together. It was effortlessly romantic. We can't wait to return. The Inn at Bowman's Hill is one of the most amazing places in the country! It's romantic, secluded and the food is excellent! We would HIGHLY recommend it to anyone looking for an incredible treat. Perfect for anniversaries, special weekends or just a private get away! Loved it. Went with my fianc� and the room and service couldn't have been better. Well worth the price. We are already looking to return in the spring. My husband and I could hardly get out of bed to go to dinner because we were so completely relaxed after our nap and then we actually rushed through our New Years Eve dinner just to get back to our room and back to that fabulous bed! The following morning we enjoyed the most delicious breakfast and we were so sad that we had to pack and check out that day! InnSide Tip - Christmas time! The decor at the Inn at Bowmans Hill is so beautiful around the holiday season it is sure to make you smile! I have never really been a Bed and Breakfast girl, but I decided to surprise my husband for our 25th anniversary and take him to the beautiful Inn at Bowman's Hill. I am now "hooked". I fell in love with the grounds, the house, the Inn Keeper, the breakfast and especially the gorgeous room. We had the best time and never wanted to leave. We got to see all of the rooms and while we stayed in the Royal Tower Suite, all of the rooms are great!! I am hoping to go back again this year for my anniversary or birthday. It is also a great place to go with a few really good friend couples. There is nothing more special than spending a Romantic night alone, no kids, to spice up a marriage!! Stay at Bowman's...I promise you wont be dissapointed!! Probably, no definitely, the best bed and breakfast you can find. From its extremely dedicated owner who caters to all of your needs, to an extremely attentive housestaff, terriffic cooks, and the most scenic spot in New Hope, you could not ask for more. The service, rooms, breakfast were all wonderful. Being near cute shops, restaurants was a bonus, but you are "far away" from it all. Wish we could have stayed longer. I brought my wife here a couple of years ago and fell in love with this place. The property is beautiful and very comfortable. As you drive in, you feel as though you're driving into your own private estate. We look forward to going back. My wife and I have stayed at the Inn twice over the past 18 months and loved it both times. Looking forward to our next excuse to return! Our visit to the Inn was absolutely romantic, relaxing, and enjoyable. Everything about the Inn is beautiful. Food was delicious and the service was great. Wanted to see more of New Hope, but just couldn't see the need to leave the Inn. Wonderful place. Went there for my 50th birthday with my fiance. Room was spectacular, service was great and the setting is breathtaking. Beautiful grounds, fabulous staff and service and most importantly an exquisite comfortable room with a luxurious bath. Once you're here, there's really no good reason to leave. 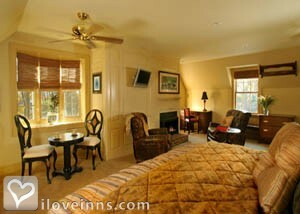 My husband and I stayed at the Bowman's Hill Inn just a month before we had our second child. It was the perfect romantic getaway for our babymoon! The room was well appointed and very comfortable. The food was excellent and the staff was extremely friendly and welcoming. I would highly recommend this Inn for a romantic getaway any time of the year!! We stayed at the Inn at Bowman's Hill to celebrate our 25th wedding aniversary this past July. It was the most romantice and relaxing overnight we've ever had. The hosts are most gracious and accomodating and the Inn itself is charming all around. We certainly hope to be able to visit again. The opening of the gates with a click of a remote is only the unique beginning to a fantasy escape. It's like the outside world no longer exists once cozied together in front of a temperature controlled fireplace, or relaxing in a bath for two. Your own refrigerator supplies the crackers and cheese, and perhaps champagne if requested. Maybe you'll be lucky enough like my husband and I were, to gaze out at the beautiful grounds as the snow gently fell. When morning comes, one of the best breakfasts I have ever eaten at an inn is prepared and brought to your own private table in the main building, as you look out at a panoramic view of a peaceful, country estate. Fantasy? No,reality at The Inn at Bowman's Hill. A Hidden Treasure in PA. The Inn at Bowman's Hill is one of our favourite inns in the world - a real "hidden treasure." Mike & Tim are the most gracious hosts, the breakfasts are to die for, the beds are romantically comfortable, the location is perfect - and not too far from Philly, we absolutely LOVE this place, & look forward to many return visits. Truly delightful, feels like a comfy home - guest are made to feel like "family." My husband and I love everything about the Inn! Beautiful in every sense of the word and the hospitality outstanding! Would recommend this inn to anyone who wants the best of everything! My husband and I stayed here for our anniversary and loved it. The room was beautiful, loved the bathroom too! I can honestly say that the breakfast was one of the best we have ever had! I would definitely recommend staying here. My husband and I stayed at The Inn at Bowman's Hill celebrating our 19th anniversary for the first time and it was the best. It was last November and we so needed a get away. It was just what we needed. It was first and foremost clean, romantic and tranquill The entrance is just gorgeous with the gates and the pond with the ducks. There were fresh baked cookies available (and coffee) through out the day. The inn keeper was friendly and helpful with directions as we made a trip to Frenchtown and New Hope for relaxing shopping. We learned about Bowmans Hill also. Weve, traveled far in the past for a getaway and now we only have to go 45 minutes to paradise...Looking forward to our next visit..Would recommend this to every couple that needs time to themselves...Thanks Inn at Bowmans! There is a country elegance here that would make the Great Gadsby feel at home. The property is serene, and every detail in our suite impeccable. 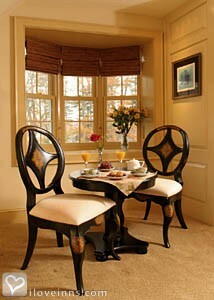 Breakfast is country good, in a room with panoramic views of the historic New Hope landscape. The staff is there to please. The Bowman Inn is a Romantic Fantasy come true. This is one of the best run, best kept, best staffed bed and breakfast I have ever been to, and I go To a lot! Would recommend and stay here again without hesitation. Had a fantastic time this past fall staying at the Inn. Great service and accommodations. Highly recommended and look forward to going back! Tim did a fantastic job assisting me in my engagement planned weekend at the Inn. My fiance and I were so impressed with the service and accommodations. Cannot wait to return! Our stay at The Inn at Bowman's Hill was actually a birthday surprise gift for my husband from our chidren. From the moment we pulled in the driveway we felt at home. Greeted at the front door by the extraordinary Host, in no time at all we felt like old friends. The beautiful grounds and surroundings just let you relax away from the hustle and busle of City living. We requested a place to dine that evening and The Inn recommneded a local restaurant in New Hope. The meal was delicious and the ambiance added our our enjoyment. That evening, the complimentary champagne by the fireplace just finished off a perfect day. The only thing "missing" was a cocktail lounge at the Inn itself. Although we enjoyed our privacy, we also enjoy meeting other travelers and learning of their experiences in life. Just up the road is historic Bowman's tower. There is an elevator to take you to the top ... very few stairs. Well worth taking in. You are also close to New Hope and Lambertville, NJ which are both artistic and historic places to visit. I have stayed at The Inn at Bowmann's Hill quite a few times. Each and every time my stay has exceeded my expectations. This is is timeless and has way of bringing you out of your everyday hustle an bustle and bringing you in to a most romantic and tranquil setting that stays with you until your next visit. Most certainly one of my favorite B&B's. The Inn at Bowman's Hill remains, by far, our favorite place for a romantic getaway. Our friends laugh at us because we live only 30 minutes away but we have the last laugh! It truly does not matter what time of year you go: A fabulous Inn with great rooms, fabulous views, wonderful service (you must have the "traditional English Breakfast"), great restaurants in the area. Our last visit was during the Christmas season and the lights were breathtaking. Time the visit right and you get a wonderful concert in the owners living room (check the web site!) I am a retired Airline Pilot and have seen Inns in many states and several countries. I will still choose The Inn at Bowmans Hill as the best! A truly spectacular property! Have fun! Although it may seem a bit pricey, try to book the Tower Suite. It is unbelievably beautiful, huge and you will find nothing like it anywhere else! Book an in room massage to complete the picture! By far the most Romantic place on earth. From the rooms to the perfectly manicured grounds. The Inn At Bowmans Hill is a paradise. Service is beyond compare. I can't wait to return and have another relaxing couples massage. I will use any excuse to get back. The best romantic get away ever! For our 25th wedding anniversary, we spend 3 days and 2 nights at the Inn at Bowman's Hill. The surroundings inside and outside were amazing as was the service. We had massages in our room, and a special meal brought in from the outside which they kept cold and served to us beautifully. By far the most romantic anniversay we ever had to date! This Bucks County "Romantic" getawy is a beautiful respite to lifes stressful demands!! My husband and I stayed at the Inn a few years ago and it was exceptionally cozy and comfy. It has such a homey feeling too. I hope to go back some day soon. My wife and I have had many, more than perfect romantic evenings at Bowmans Inn. The staff has always been assertive but not pushy, foods great atmosphere is always just right! Looking forward to many more wonderfull stays at the Inn at Bowmans Hill. If you do, you may be disappointed.....because you will be wishing you had booked for two or three. It's that good!! A wonderful place to spend a romantic weekend. Lovely property and close to town. My most romantic memory is of my first trip to The Inn at Bowman's Hill. From the moment we drove through the iron gate onto the impeccable property I knew I found a very special place. The warm service, the lovely and cozy room with its'exquisite sheets on the comfy feather bed, charming amenities plus the bath and shower for 2 made for an incredibly romantic experience. The grounds are beautifully maintained so you can enjoy a romantic walk around the garden and feed the fish in the pond! The delicious in-room breakfast was quite special as was the champagne. My husband surprised me with a stay at the Inn at Bowman's Hill. We have visited many B and B's over the years, and Bowman's is one of the nicest. Everything about the inn is well thought out and arranged to make any couple's stay romantic and relaxing. We loved the inn. An hour drive to peace and quiet and unobtrusive service. We hope to make time to visit again, soon. One of the most lovely and romantic inns that we have had the opportunity to stay at. We had a mid-week getaway in January at The Inn at Bowman's Hill as part of an ongoing 25th anniversary celebration. The Inn is gorgeous, nestled in beautiful Bucks County between Washington Crossing and New Hope. Everything is beautifully appointed, the room was warm and cozy with a fireplace. soft lighting, amazing bath (even a towel warmer)and gorgeous linens. At breakfast in the morning we were greeted with a roaring fire in the huge breakfast room fireplace, lively conversation with our host, fresh berries, muffins and a made to order breakfast. Loved my surprise trip from my husband for our anniversary! Romantic room and wonderful food! My husband and I had the pleasure of staying here for our honeymoon. From the moment we arrived we felt special. From the beautiful grounds,to the friendly and helpful staff,to the delicious complimentary snacks. We felt as if we had the whole place to ourselves! The Inn is conveniently located a few miles from all of the attractions New Hope has to offer, but we didn't want to, nor need to leave because of all of the wonderful amenities the Inn has to offer. The Inn at Bowman's Hill really made our honeymoon special and it will always be held dear to our hearts! My wife and I have stayed at the Inn at Bowman's Hill in every season, plus once during a flood. It has never failed to be the best in every way. It's our favorite romantic get-away. Our perfect private celebration. Our 15th Anniversary was spent at the Inn as the season changed from summer to autumn. A beautiful moonlit evening as we toasted on our balcony and an early walk to the Gazebo through the morning dew before a fantastic breakfast. A deep breath of fresh air and a feeling of Romance only to be repeated on our 17th. Mesmerizing. And planning for our 18th as well. This Inn was by far the best weekend getaway I ever went on! The Inn was a perfect setting for my husband and I. We loved the fireplaces, the quant breakfast area, the outdoor amenities and the friendly staff. Our room was also perfect. I have already sent friend there and would recommend this Inn to everyone! Upon entering the property, the lights glowed through the autumnal colored trees along the path to the entrance of the suite. This truly was a magical time. The inn keeper was helpful with getting us settled and offered us tea and cookies. The room was stunningly decorated with just the right touches of comfort and sophistication. The coy pond and free range chickens topped off the experience as the most amazing weekend getaway we have had! Thank you, thank, thank you. this is the most "Romantic" place i have ever seen for the last two years my boyfriend and i have tried to plan a stay at this beautiful inn. but due to money problems we have not been able to so i am hoping to win the free stay. Who knew such a romantic and beautiful place was so close to my home??. The Inn at Bowman is breathtaking. Would recommend to all who want to a getaway from the city and just relax!! My wife and I spent a wonderful weekend at The Inn at Bowman's Hill. A beautiful spot, wonderful room, an amazing couples massage and a charming, attentive Innkeeper. The breakfast was a delight. Tucked away on a beautiful bucolic spot is INN AT BOWMAN'S HILL.Sophisticated yet comfy-it offers a romantic and lovely respite from a hectic world.Yummy food and wonderful hospitality makes this inn a must visit spot. The perfect place to spend the weekend as an escape from the day to day life with kids. Every detail was handled with such care, from the moment we arrived. A friend once told me that The Inn at Bowman's Hill was truly an unforgetable experience, one that you shouldn't miss..a lovely,charming,romantic getaway! Love to spend time together at the Inn. The Inn at Bowman's Hill was one of the most incredible experiences I've ever had. Down to the last detail, the innkeeper and his wife have thought of EVERYTHING! My wife and I went for our "minimoon" and it felt as though we traveled back in time. We felt as though we were treated like royalty. From the grounds to the gourmet food to the amenities to the jawdropping rooms. Just perfect and we've been back twice since and looking to go back as soon as possible. But be careful because everything will pale in comparison after you stay here. Truly a perfect, romantic getaway. The Inn at Bowman's Hill was Absolutely, hands down, the most romantic, relaxing and beautuitful getaway I've ever been to. The owner was a delight to chat with as well as being present, helpful and wonderful. The staff members were welcoming and met every need or want that we could have ever imagined. The rooms were amazing, comfortable and extremely romantic and the property was something out if a fairy tale. Not to mention that the location is New Hope,PA, which is the perfect little town for a relaxing getaway. Perfect in every way. Overall, the Inn was the most perfect romantic getaway run by the best people and I would recommend it to anyone. So Romantic!!! Even in the Italian langauge, The Inn at Bowwman's Hill is as beautiful as it sounds. My Husband and I stayed for our 15 years Anniversary and look forward to stay again. From your chocolate-covered strawberries (which my husband requested seconds) to your in-room couples massage, our stay was Magnificent! The Inn at Bowman's Hill is pure Heaven nestled into quaint Bucks County. It's a short drive from Philadelphia, but you feel a world away! It's a relaxing escape from everyday life. We enjoyed such a delicious breakfast that we still yearn for every morning!We each enjoyed massages and were able to unwind completely! A great escape sp close to home! WE would recommend to anyone! Our restful and romantic visit to The Inn at Bowman's Hill is a treasured memory in our hearts.The Inn displayed a feeling of sweetness and serene quiet time for loving couples.Our romantic memories started from breakfast in bed, afternoon hand and in hand walks on the beautiful grounds to an inviting evening romantic bath for two. As the saying goes...Romance was in the Air!After a lovely day we were greeted with the most comfortable bed we ever experienced. I'm so grateful for this romantic visit. We felt like royality in a beautiful seculsive Inn. Last year my fianc�e and I visited the Inn at Bowman's Hill, and we were absolutely amazed with the entire experience. We had never stayed at any bed and breakfast before the Inn, nor will we ever stay at any other bed and breakfast besides the Inn again. The estate was beautiful, the breakfast was a classic English fry up at its best! But most importantly from when you first arrive, until your departure, you are enveloped in heartwarming hospitality. Our romantic retreat to the Inn at Bowman's Hill was absolutely a one of a kind experience that every couple should experience at least once...every year! My husband and I made a last minute reservation to stay at Bowman's Hill simply to getaway for a weekend. It was the best last minute decision we have ever made. From the minute we checked in to the minute we left we extremly comforatable and relaxed in the warm and beautifully decorated Inn. We are plaaning to return soon for our next local escape! I surprised my wife for our twenty year anniversary. What a place! I routinely recommend this Inn to others. We visited for two days shortly before new years. The day we arrived we had a snowfall of about two inches. The snowfall just added to the beauty of the inn. The moment the front gates opened with the xmas wreaths on it, you knew you were at a special place. The moment we arrived, Tim the innkeeper greeted us. The room we had was very comfortable and well supplied with snacks. The bathroom was very nice with a big shower and fabulous hottub. The mornings were fantastic with your choice of breakfast items. The food was delicious. Mike the boss made his appearance at breakfast and immediately made everyone feel at home. The grounds were absolutely beautiful with the xmas decorations lite. If you have that special person in your life, a stay at Bowmans Hill is a must. Thank you mike and tim for making our stay special. We will be back again. We were lucky enough to meet a couple on our 25th aniversary on a small ship cruise to Italy and Monte Carlo. We hit it off immediately. Since we live in New Jersey and they live in Vegas it works out great. We travel to Vegas four times a year and relive our times together. We all love Great food and outstanding wines and when we met last year at the Bowman's Hill Inn, we loved the small intamency and appreciation shown by the entire staff. The breakfast was to die for. How often can you go out (early enough) to pick you own eggs? I look forward to our next meeting with our friends. You can't help but be awed by The Inn at Bowman's Hill! We have traveled extensively so imagine finding this lovely site so close to home! Once the gates close you are transported to quiet, four star luxury. Puruse the rooms on the net and pick you own nest. Every room is decorated beautifully, ready for your comfort. The conservatory is just lovely; the exterior pool and landscaping welcome you to an afternoon of leisure. The breakfast is delicious and served in your room or in the welcoming dining room. If you venture off the property you will be delighted by all there is to do in the surrounding areas. Treat yourselves - you deserve it! Romance is in your future.